What to do about jumping dogs! Dogs jumping up on owners, their families or their guests is one of the most common issues that clients present to dog trainers to have fixed. Traditionally balanced trainers have always recommended that you push the dog away, growl at it, use something it hates to make it understand that it is a undesirable behaviour. In so doing that will make the dog stop doing it. To some degree this works but positive reward based trainers know there is a much kinder solution that works just as effectively, just as fast and is kinder to your dog. “Method 1 (slowest) – totally ignoring the dog and assertively standing your ground and pushing the dog away with your knee (NOT kicking), and offering no eye contact, no talk and no touch. If we are persistent and consistent with this method, eventually the dog will learn that this attention seeking behaviour receives absolutely no interaction from us. If there is no payoff for a behaviour, then the behaviour eventually dies. Here is what Method 1 looks like but using hands to push away not feet. The important points to note are that it is not working, the dog’s jumping is getting more and more agitated and stressed (shake off, lip licks) the dogs in the background are picking up on his stress and the dog is moving further and further away from the trainer and being less interested in approaching. When it does approach it is tentative. At this point under the instructions above you would be told to find a way to punish the dog more to stop the behaviour. I treat dogs with kindness and respect and do not believe in punishment so I will never subject any dog to that. Let’s look at the positive alternative used on this same dog. He spends the first 15 seconds moving around in a much less agitated way than in the previous video then automatically sits with no cue from the trainer. The trainer has stayed still, not touched the dog, not made eye contact and not attempted to punish the dog. The only thing they do is say “Yes” a marker word to indicate that the sit was a good thing. Note the absence of any clicker or food being used to obtain this behaviour. The trainer pats the dog and then stands back up again. This time it only takes 5 seconds for the dog to offer a sit. Then on a third trial it takes 6 seconds. Notice to that the dog is happy to make eye contact and stay very close to the trainer, unlike in the previous video. The reward being used in this case was a good dog and pat, and then having the lead attached and going in the car for a car ride (this is called a life reward).This dog is one that does not have a very well educated automatic sit. Let’s look now at a dog that does have a stronger automatic sit response and see how effective this technique can be. A normal very excitable miniature poodle and he sits within 6 seconds using the same technique. Then he does the same thing three more times to show it is a reliable technique. The same marker work “yes” and the same reward “good boy” pat and go into the car for a trip is used. Three automatic sits in the space of 30 seconds, no yelling, no punishment needed. Not all dogs however will do an automatic sit. Some like this dog prefer to be able to touch the person but it needs to be done in a way that is acceptable to both parties. This dog has some separation anxiety and really hurts when he jumps up as he is concerned about being left behind. Same marker word “yes” but this time he is being asked to touch a hand held away from the body. The trainer is required to push away somewhat from the body contact as it does hurt. However they still continue not to yell or punish. A gentle “no” is used as this dog needs that sort of guidance to succeed in any task. As you can see he is anxious and this anxiety is stopping him from being able to learn. By giving him a hand to touch it helps he come back into the part of his brain that allows learning to occur. When dogs are fearful and anxious, as they are if being punished, they are not able to learn effectively. This demonstrates the flexibility of positive training. 3) Food is not always the reward given, life rewards can be just as effective. Are our dogs affected by stress? Christmas has just finished and for many people that is a very stressful time of year. We know how it feels to be stressed suffering with headaches, tiredness, sweaty palms, irritability but what is actually going on in the body biochemically when under stress? Is all stress bad? Crashing the car, losing a job, trashing the remote control (OK that is just the guys) are clearly incidences of bad stress, also called Distress. Good stress or Eu-stress is getting married, having a fantastic holiday or even winning a million dollars. The chemical reactions occurring in the body during either are identical. Dogs also experience stress any time they are threatened and the flight or fight response kicks in. That might be in a veterinary surgery, at the groomers or even at the dog park when a gang of not so nice dogs comes running. It might even be when the next door kid jumps all over the dog in a not so enjoyable hug. Hans Selye (1907-1982) is generally considered one of the key investigators into the human stress response with his work on the General Adaption System (GAS). He observed that the body responds to any external biological source of stress with a predictable biological pattern that attempts to restore the body’s internal homeostasis. The initial hormonal reaction is the fight or flight stress response and it evolved to handle stress quickly. Cavemen needed to fight the scary monster or flee rapidly. Shock phase: in which a stressor effect occurs that resembles Addison’s disease. The body goes into a level of circulatory shock that results in changes including reductions in blood volume , sodium, osmolarity, blood chlorine and blood sugar. Antishock phase: The threat or stressor is identified and the body becomes alarmed. The sympathetic nervous system is activated and adrenaline is produced resulting in the fight-or-flight response with increases in muscular tonus, blood pressure and blood glucose. Glucocorticoids such as the stress hormone cortisol are produced. The blood pressure surge due to adrenalin damages blood vessels of the heart and brain potentially leading to heart attack and stroke. Damage to cells and muscle tissues due to cortisol release which has been implicated in cardiovascular conditions, stroke, gastric ulcers and high blood sugar levels. This stage occurs when the source of stress is possibly resolved due to the fight or flight response being enacted. Homeostasis begins restoring balance and a period of recovery for repair and renewal takes place. Stress hormone levels may return to normal but you may have reduced defenses and adaptive energy left. However if the stressful condition persists the body may adapt by continuing to resist the stressor and staying in a state of arousal. If this process repeats too often with little or no recovery then problems will occur as seen in the final stage. If the stress continues for so long the body’s ability to resist is lost as the adaptation energy supply is depleted. Stress levels go up and stay up in what is commonly called overload, burnout, adrenal fatigue, mal-adaptation or dysfunction. I believe in dogs this is what happens when they shut down due to chronic stress such as that experienced when flooding occurs in what is commonly called freeze. The ability to react stops but hormones continue to circulate. This is the stage of the general adaption syndrome that is most hazardous to health. It looks like the fight is over physically but biochemically the body is stuck in a vicious feedback cycle. Chronic stress can damage nerve cells in tissues and organs with the hippocampus section of the brain being most vulnerable Thinking and memory are likely to become impaired, triggering anxiety and depression in dogs and humans. Adverse effects on the autonomic nervous system can contribute to high blood pressure, heart disease, arthritis and other stress related illnesses. Cortisol levels, with a primary function to redistribute energy (glucose) to regions of the body most needing it to flee or fight e.g. major muscles and the brain, stay high. It also acts to suppress the body’s immune system. Hence organisms under chronic stress may succumb to immune complex diseases such as Addison’s and Cushing’s diseases both of which are on the rise in the dog population. The body becomes vulnerable to immune system attacks. There is a clear link between levels of stress, especially chronic stress, and the production of disease. This list of effects reads like a who’s who of all the diseases that are on the rise not only in the canine population but also in humans. I am sure if we could get dogs to tell us how they are feeling we would also find many more of the symptoms of excessive stress also being present. The conclusion to this long list of biochemical processes and diseases is what? Understanding that EXCESSIVE levels of stress are bad for all animals (two and four legged) and that we need to reduce them wherever possible. Stress exists for a reason and all stress is not bad but chronic stress is and the more we force dogs to exist in our world by relying on stressful equipment such as electronic fences and collars and ensuring that dogs live in a way far removed from their natural way of life the more disease we will see in the canine population. The more humans place themselves in situations of excessive stress the sicker they will become. We also need to see research into the effects of chronic stress on dogs and the link in dogs between stress and disease. I first started training dogs over 43 years ago with a very patient black Labrador named Lisa and a check chain. Poor Lisa she was drilled every walk and I used a leash pop with the check chain as the cue to make her sit. (Sorry Lisa I really wish I knew then what I know now, Please forgive me). Lisa was a garbage guts and the use of food would have revolutionized our training but I was not to know. Then I got my chow chow called Chi. My first dog that was all mine not the families. I had no experience with a Spitz breed and no understanding that when they didn’t want to do something they just didn’t do it. Neither did the head trainers at the top obedience clubs (who shall remain nameless) that we frequented over her life. More drilling for an hour each day and more leash pops and no food still and very little training at home. Sorry Chi but you and Lisa must be shaking your heads at me up there in doggy heaven. I did get drops and sits and sort of recalls but never to a competition standard. I just had the wrong dog for obedience I was told as none of the head trainers could work her out either. Barbara Woodhouse was all the rage on TV and “walkies” in a high sing song voice was the catch phrase. Great to get a dog to walk with you but useless for a dog that insisted on pulling me along. Along came my first Belgian Shepherd called Mistral and by this time we were still leash popping with choke chains now renamed check chains but we had also added alpha rolls and be a pack leader to our techniques. This was back in the mid 80’s and it is a wonder I never got my head bitten off. I decided to try out conformation showing with Mistral as I really didn’t have the hours to devote to obedience training. This introduced me to the use of baiting with food or a toy in the ring to get the dogs attention. That worked well, we came to the line up and used food to get the dog to give good eye contact. Why didn’t I think about food for other uses outside the ring? Meanwhile Chi was still barging badly on a lead, dragging me all over town on our walks and I had heard of a trainer that had another method that might be helpful for her. Off Chi and I went to a lady call Chris Johnson (or Johnstone) who introduced me to a more positive method of working with my dog not trying to force her into what I wanted. Well that was an amazing about turn and unbeknownst to me I had started on my route as a positive trainer. In a couple of lessons she achieved what hours and hours of obedience club drilling and lease pops had not. Chi was a different dog and we could enjoy lovely walks and I commenced to implement her techniques on hundreds of dogs from that point on. Many Belgian Shepherds later I am still using food as a bait in the show ring but not so outside the ring. Fast forward to early 2000 and I have Mistral II. Crazy woman, says my ex-husband, why get another dog and call it the name of the first nut case that was Mistral I and expect to be anything other than a handful. Yep he was right Mistral II just refused to get the recall command. A high prey drive that meant she was totally oblivious to even $200 a kg steak waved under her nose when cows were around to chase. I went off and brought Melissa Alexander’s Click for Joy book and a clicker and armed myself with the yummiest of treats. It was OK as a training method if the cows were not around I got much better compliance from Mistral II but I really couldn’t get the hang of clicker training and well old habits die hard. Back to the check chain (which I was fairly well trained in using to check and release) and more hours and hours of obedience club drills. Forward and back, in and out, weaves, sit, drop and stand your dog. She did it but well she never really enjoyed it, neither did Jet or Alexia. By this time I was also working as a groomer and had gained a reputation of handling very difficult dogs that others were not able to. I had rehabilitated numerous hard to groom dogs and learn many things about what goes on inside a dog’s head. I found out that force achieves nothing but force or aggression back. I decided to enroll in the Certificate IV companion animal studies with Delta Australia and the second of the one in a million trainers came into my life. Kerrie Haynes-Lovell taught me how to use a clicker correctly and the pivotal moment is still strong in my memory. Over at the RSPCA at Yagoona with Kerrie behind my shoulder and me facing a young lab cross (Lisa reincarnated I believe) who was jumping six feet in the air. With Kerrie’s assistance that dog had stopped jumping in about 2 mins. I was hooked. Late in this course I had to produce a video showing me training a complex task with a dog and a simple task with another species. Which dog and which species was the issue. After trials and tribulations with the long suffering Nicky the Belgian cross farm dog, Cherry the miniature poodle, Zena the horse and a unnamed ferret I settled on Zena for the simple other species task and Cherry for the complex task. Neither of these animals had ever been clicker trained and I had jumped into the deep end of the swimming pool. Zena was pretty easy as all I had to go was convince her to touch my hand when she got clicked and rewarded. That took a few sessions as she was being trained with no restraint so when it all got to hard for her she walked off. Cherry was much harder. She belonged to my business partner and had a number of behavioral issues as a reactive dog. She also had had limited training and I had decided to get her to discriminate between two different margarine container lids called one and two on command. An inexperienced dog and inexperienced trainer and a deadline for assignment submission to a person who would see all the faults wasn’t fun. But cherry got it and a bonus was for the first time ever this training made her relax and sleep properly. 30 minutes of training and she would then curl up on the lounge and snore for 2 hours. Bliss! Since then I have started many dogs using reward based training, always off lead where possible. I have trained many dogs who have been trained under force based punishment methods and rehabilitated all of them. I still have not stopped Mistral II from chasing cows as it is not possible to undo hardwired genetic behavior, she is managed so she does not get a chance to chase them. Would I ever go back to force based punishment methods? No way as using positive reward based methods means I have fun, the dog has fun and my client has fun. 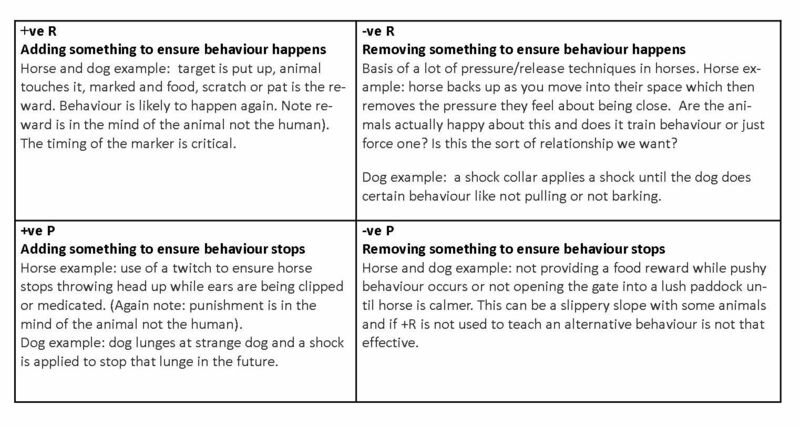 It is a delight every time I find a new dog and owner that this wonderful method can be used to change their lives and in a very short few minutes “fix” serious behaviors that owners had not had success fixing before. BUT I am so sorry I never worked this out 43 years ago. I have been writing lately about fearful versus aggressive dogs and also about how the grooming process can flood dogs and set up unwanted aggressive behaviors It is not uncommon in a grooming salon to have a new dog in and when you start to do something like check in their ears or scissor or clipper near their face the dogs go ballistic. Screaming and throwing their bodies around, even biting. Why would the dogs do this when the groomer has never touched them before and didn’t touch them in an aversive way? Not all dogs are flooded in professional settings and not all dogs react to aversive events in the same way. In humans a disorder known as Post Traumatic Stress Disorder (PTSD) is well known. It is commonly seen as a result of being involved in traumatic events. There will be a number of PTSD cases as a result of the tragic school shooting recently in the US. It is well known in soldiers and policeman who are regularly involved in traumatic events. What is not understood is why PTSD affects some individuals and not others even thought they have been through the same experiences or why a person can get PTSD from one traumatic event whereas others who get it experience months or years of trauma before being affected. Even people who do not witness the event but are affected by it can get PTSD. PTSD is not well documented or understood in dogs. Do dogs get PTSD? If you take a dog that has lived many years in a puppy mill situation regularly being punished with lack of food, heavily matted coats causing pain, fleas, worms and even dog fights, or suffering spacial deprivation it would stand to reason that the repeated trauma to those dogs would result in some degree of PTSD. Do dogs that attend a groomer that regularly exposes them to forceful procedures that the dogs are forced to endure, such as dryers and clipping get PTSD? Do dogs that are harshly punished day in and day out at home for simple normal doggy behaviors such as barking get PTSD? Go back to the example I started with, a dog that when you put scissors to its face goes ballistic and bites. Some years ago this happened to me when grooming and after finishing the groom I returned the dog to the owner and asked why he was so upset about scissors near his face. The owner then told me that they had been trying to trim the dogs face and had cut his face a few times. I also regularly see this effect of dogs retaining memory of trauma when it comes to issues with feet. If I get a dog that fights badly over a particular foot it is not uncommon for the owner, when asked, to tell you the dog hurt that foot badly years ago. A puppy that was living with me years ago broke her front leg and to this day she panics whenever that leg is about to be touched. This is not a physical issue as the panic starts before touching the leg. The work I have been doing with River demonstrates this as well. River is a farm dog, rarely goes into town and in order to take these videos and have him see a vet for allergies I had to forcibly put him into the car crate to take him to town. He was not impressed but eventually I got him in and traveled the short distance with no ill effect. However on every day since then when he gets into the car crate he lets go of his bowels. I have had to perform the desensitization/counter-conditioning process for the car crate as well as the grooming salon crate. One bad experience and he was traumatized, likewise one bad experience for a dog when being groomed and they may be traumatized. One bad experience or ten of an owner who is trying to clip their dogs face or pluck ear hair and they may be traumatized This may well fit the diagnosis of PTSD in dogs. There is very little in the literature about this disorder in dogs. How often do we force our dogs to do something they don’t like and how often do we think about the consequences of doing this and find a more humane way to do it or do we just adopt the attitude “they will deal with it” Luckily many dogs do deal with it and do get over it but not all do.